Today we’re delighted to welcome another charming burlesque artist, the creative and talented Kita St. Cyr, who presents us with our album of the week: Tabu! Volume 1, a 1960s compilation of Exotica, Rockabilly, Blues, and you name it! 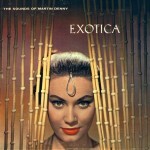 We also receive a fascinating lesson on Exotica as a genre, and of course get the inside scoop on Kita and her art. burlesque, compilation, events, exotica, interviews, rockabilly, surf rock, tours / live shows. Bookmark. Hey! Fonts are cool, dammit.